After seeing a photo of the final product for the Daring Bakers Challenge this month, I got a little scared – although quite excited at the thought of making this beautiful cake or torte. 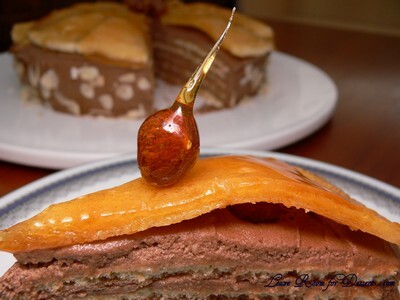 I had never heard of a Dobos Torte (also called Dobos Torta) before, and therefore never tried it – but it looked so gorgeous, it had to be good. Multiple layers of sponge cake, chocolate buttercream and decorated with sponge covered in toffee or caramel then cut and arranged over the top of the cake… Eeeek. 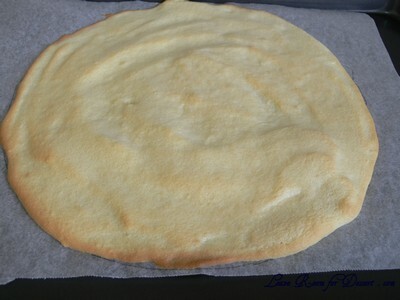 Everything worked quite well, the sponges took a little while, spreading the mixture between 6 trays and cooking them. The buttercream tasted beautiful and buttery with a lovely chocolate flavour. My main problem occurred when making the caramel. I’ve never had caramel do this before, but it was producing heaps of bubbles, they were almost climbing out of the small saucepan I used and made it quite difficult to keep it at a high temperature and also try to see the colour it was changing to. 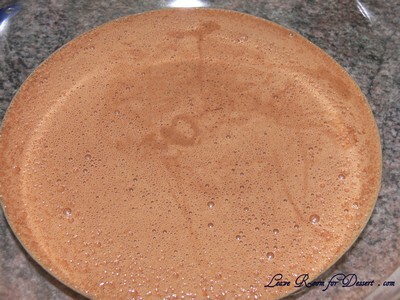 Once it turned a lovely amber colour, I decided to pour it over the sponge and also make some toffee hazelnuts. Although with soft sticky caramel which didn’t want to set/harden… the top layer and hazelnuts didn’t turn out quite how I had wanted. Both were a bit droopy and stuck quite a bit to everyone’s teeth. 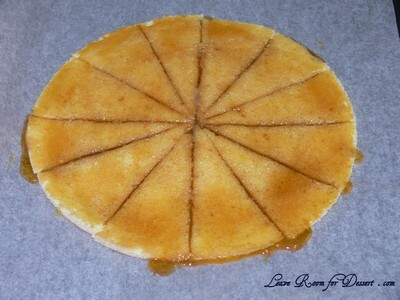 I would try another caramel recipe for the top, if I were to try it again, perhaps a recipe that says what temperature the caramel should get to. 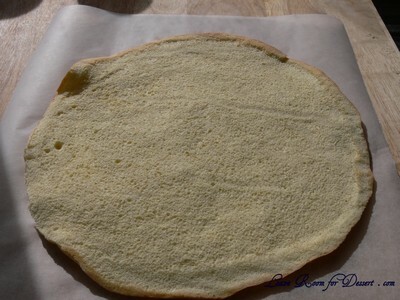 Sponge layers: 20 mins prep, 40 mins cooking total if baking each layer individually. 4. 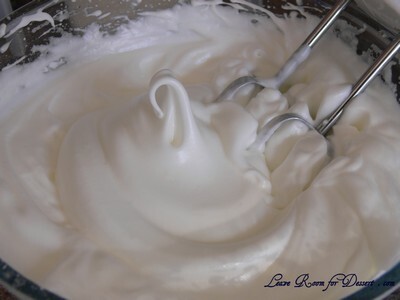 In another bowl, using clean beaters, beat the egg whites until soft peaks form. Gradually beat in the remaining 2/3 cup (81g) of confectioner’s (icing)sugar until the whites form stiff, shiny peaks. 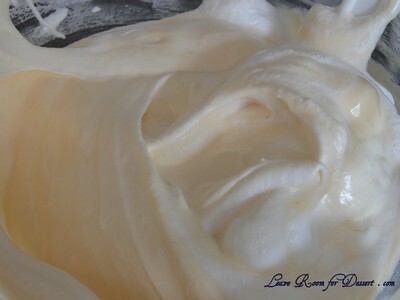 Using a large rubber spatula, stir about 1/4 of the beaten whites into the egg yolk mixture, then fold in the remainder, leaving a few wisps of white visible. Combine the flour and salt. 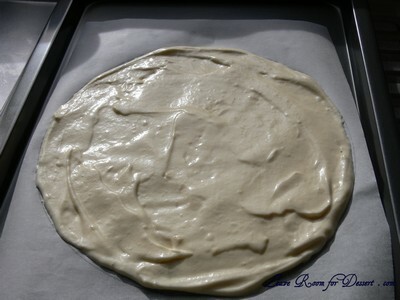 Sift half the flour over the eggs, and fold in; repeat with the remaining flour. 3. The top layer is perhaps the hardest part of the whole cake so make sure you have a oiled, hot offset spatula ready. I also find it helps if the cake layer hasn’t just been taken out of the refrigerator. I made mine ahead of time and the cake layer was cold and the toffee set very, very quickly—too quickly for me to spread it. Immediately pour all of the hot caramel over the cake layer. You will have some leftover most probably but more is better than less and you can always make nice toffee pattern using the extra to decorate. Using the offset spatula, quickly spread the caramel evenly to the edge of the cake layer. Let cool until beginning to set, about 30 seconds. Using the tip of the hot oiled knife (keep re-oiling this with a pastry brush between cutting), cut through the scored marks to divide the caramel layer into 12 equal wedges. Cool another minute or so, then use the edge of the knife to completely cut and separate the wedges using one firm slice movement (rather than rocking back and forth which may produce toffee strands). Cool completely. 4. Propping a hazelnut under each wedge so that it sits at an angle, arrange the wedges on top of the cake in a spoke pattern. If you have any leftover buttercream, you can pipe rosettes under each hazelnut or a large rosette in the centre of the cake. Refrigerate the cake under a cake dome until the icing is set, about 2 hours. Let slices come to room temperature for the best possible flavour. Angela’s notes: I am quite happy to store this cake at room temperature under a glass dome, but your mileage may vary. If you do decide to chill it, then I would advise also using a glass dome if you have done. I should also note that the cake will cut more cleanly when chilled. 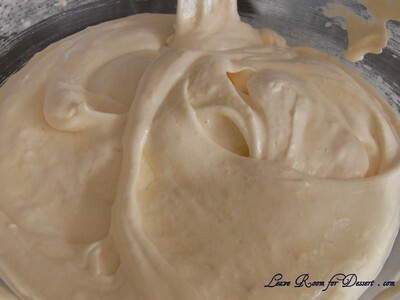 Egg concerns: The cooking process for the buttercream will produce lightly cooked eggs. If you fall into a vulnerable health group then you may wish to use an egg-less buttercream. the caramel was a pain. but it does look good. Anita, your torte looks so beautiful. I love the caramel hazelnuts you have also made as an additional touch. I only had issues with the caramel, too. It seemed really watery to me. I agree, would have liked a temperature as a gauge as well. Great work! I love the caramel hazelnuts, they look like cherries with their shape! 🙂 I heard the caramel was an issue for a lot of people who were doing the challenge, it still looks great though! 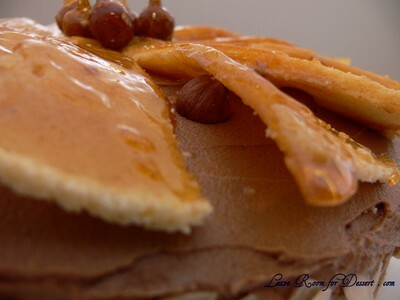 I think your torte looks wonderful – and the toffee hazelnuts on top are so cute. Anita it looks great and I love your caramel hazelnuts. Yes the caramel was definitely the hardest part of the challenge! Love the caramel hazelnuts…they look like caramel cherry bombs 🙂 Beautiful. Gorgeous torta! Love the caramel hazelnuts. 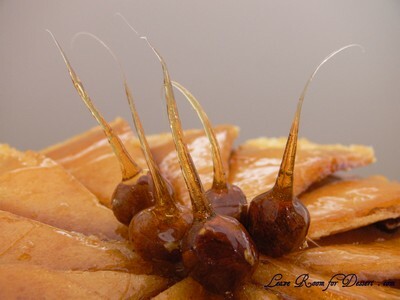 I had a sticky time with the caramel too. Just didn’t turn out the way I imagined in my head! Your cake is lovely! 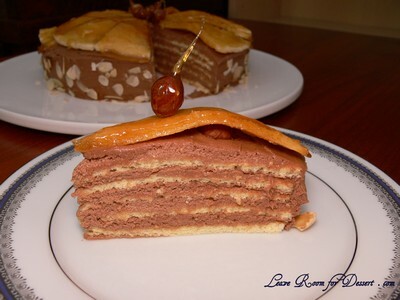 Your torte is so nicely done! I had the same problem with the caramel bubbles. Blame it on the lemon juice. I love your toffee hazelnuts!! That looks complicated, but I love all the chocolatey layers at the end. I agree about needing a temperature for caramel – colour is too subjective. I love that you dipped your nuts in caramel! Great job! I love the caramelized hazelnuts! I wanted to do that, too. Lovely job. A beautiful torte! 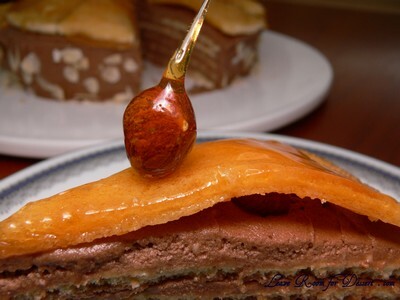 I love the caramelized hazelnut decorations! Very well done! Gorgoeus torte Anita! Maybe that will help me find my chocolate appetite again! Proud to be a Daring Baker with you! 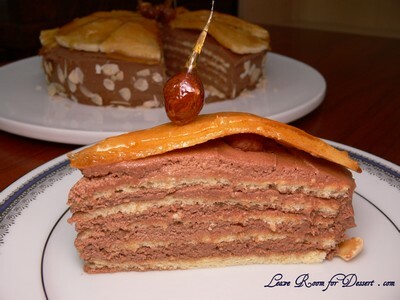 Wow, your torte looks delicious…very nice decorated…yummie! Awesome job!! Your torte looks stunning =D. Wonderful job with this challenge! What a gorgeous torte! Beautiful presentation – I love the caramelized halzenuts! Those hazelnuts are so darling! I have been looking at everyone’s cakes that have done this challenge, and you have the cutest version! Nice work with the layering, and love the decorations! Anita great job on the hazelnuts! The cake/torte looks great. I, like you, prefer a toffee/caramel recipe where there is a temperature set to help you gauge the right end point, takes the guessing out of the game. Just use white sugar for the caramel–no liquid. Cook on high heat in a heavy pan until it turns light amber. You just have to watch that it doesn’t burn, otherwise it’s easy. My sister was having the same problem and asked me to show her. I think I learned this way from our Mom who was Hungarian. 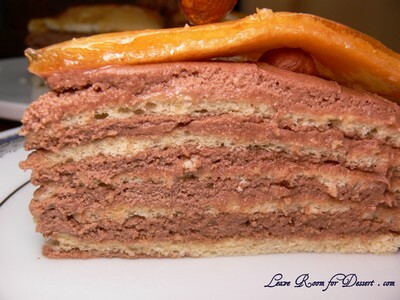 Is there anywhere where I can buy a Dobosh Torta for a birthday party? 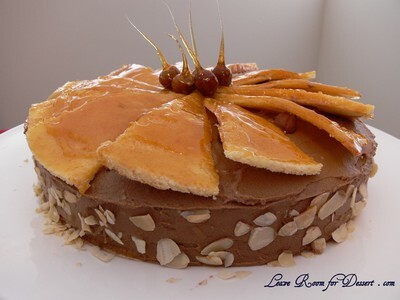 I haven’t seen Dobos Torta anywhere around Sydney. Sorry I can’t help!